There are scientific and social reasons to use technology in museums, but there is still a lot to learn about how technology influences engagement, learning, interaction and the overall experience. 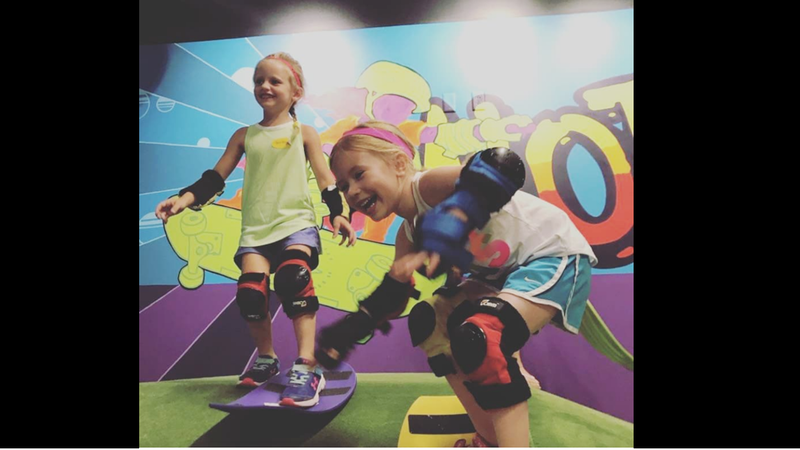 “The Notion of Motion: Science of Skateboarding” opened earlier this summer after two years of design and planning by Missall and her research partners at the museum and University of Iowa College of Education. Over the coming year, Missall will focus on two important issues in informal learning environments: the intersections and transitions from physical learning activities into more abstract, digital learning activities and how children and adults use the space together. Missall, who also consults with Imagine Children’s Museum in Everett, answered questions about the development of the new exhibit, what she’ll be studying as the public begins using the new exhibit, and how her research could impact other children’s museums. What is your role in the “Notion of Motion” exhibit project? My role on the project is related to work focused on how children learn through play, and how adult-child interaction during play affects learning. My fellow PIs include Dr. Benjamin DeVane from the College of Education at the University of Iowa and Deb Dunkhase, director of the ICM. Dr. DeVane has specific expertise in digital gameplay learning, which is a centerpiece of the exhibit, and Deb Dunkhase has expertise in exhibit development in children’s museum settings. What principles guided the development of the new exhibit? “Notion of Motion” is funded by a branch of NSF called Applied and Informal Science Learning which is concerned with how children experience learning about STEM concepts in informal environments like museums, zoos, aquariums and so on. Therefore, all our research questions grew from an interest in how children explore natural environments and demonstrate engagement and learning. Specifically, we focus uniquely on two components of informal learning: 1) physical to digital learning, and 2) inter-generational play. 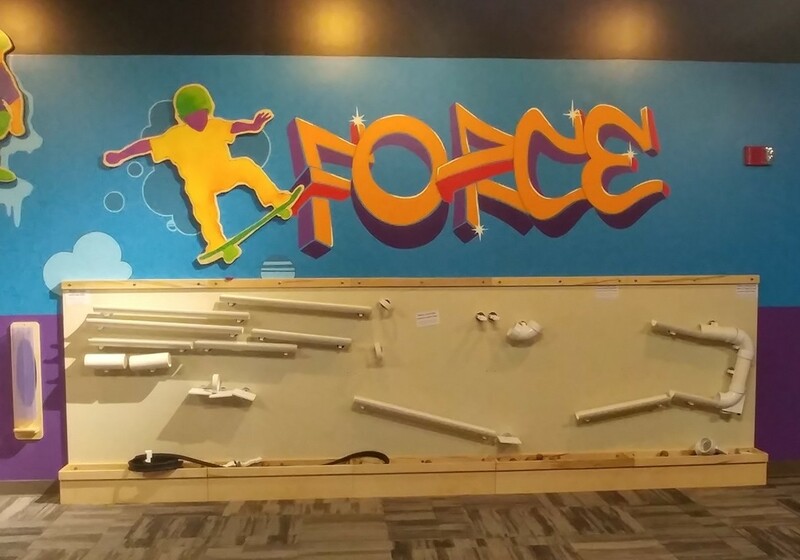 First, each element of the exhibit, which is a large room filled with 10 distinct and interactive areas, draws on a concept of the physics of skateboarding (e.g., friction, momentum, mass). The many physically-oriented activities (e.g., friction hill, modular skatepark blocks, skateshop, skate race, balance boards) all lead exhibit users to two large, interactive, multi-touch tabletops where children and adults alike can build and test a virtual skatepark, complete with customizable skater avatars. Second, while visitors of all ages can experience the exhibit, we are particularly interested in how adults and children interact. Research has shown that adult-child interactions that support learning in informal settings can help set the trajectory for children’s interest in learning in formal settings like classrooms. With “Notion of Motion,” adults have the opportunity to introduce basic physics concepts, experiences and communications in an informal, play-based setting that may contribute to their child’s greater physics interest and learning in years to come. What aspects of the exhibit stand out to you? It’s typical in children’s museums that within an exhibit, the components fit together topically. However, we were intentional with exhibit design that children’s experiences should grow in engagement and complexity as children experience the exhibit in real time. 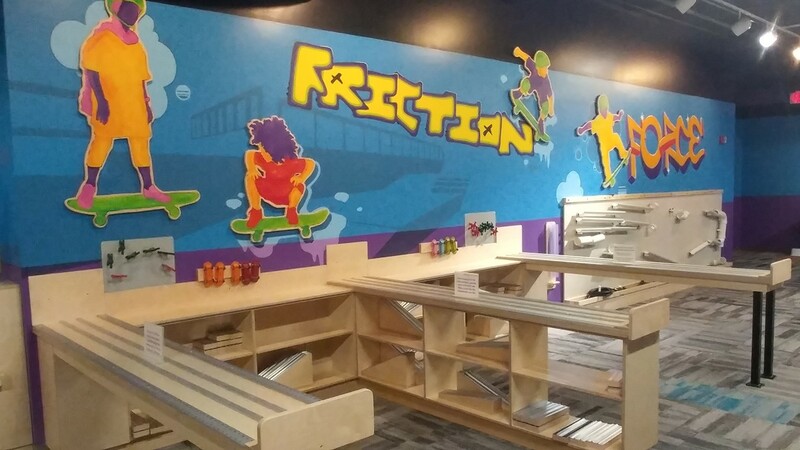 For example, the exhibit activities are placed in the space such that children are likely to first have a real-time experience with friction as they slide or skate down Friction Hill on a board or sled, and then they are likely to move to the Modular Skatepark where they can build a structure using blocks with varying surfaces (e.g., smooth wood, sand paper, turf) to test the concept of friction in more abstract ways than on Friction Hill. I am really excited to see how visitors engage with the exhibit components and demonstrate learning. I am also very excited to see how visitors use the interactive tabletop. During year two of the study we tested 11 iterations of the skatepark videogame software with parent-child dyads and made many modifications to layout, content, challenges, intuitive expectations and so on. We want the full exhibit to be accessible for all children and families. What will you be studying over the coming year as children start to experience the exhibit? The research in year three of the project centers on two key issues: physical to digital learning and intergenerational play. We’ll start to gather information by conducting a space study to determine how children and adults use the exhibit space. We have hypotheses about which of the physically-oriented exhibit components (e.g., Module Skatepark, Skateboard Races) will inform interactions with the digitally-oriented tabletop in the exhibit. Once we have evidence of movement patterns to support our hypotheses, we can start to examine the behavior of individual visitors more closely. For example, we are interested in where visitors spend their time, the language they use that might be indicative of physics learning, verbal and nonverbal interaction patterns, and play constructions (e.g., individual, child-child dyad or group, child-adult dyad or group). We will look specifically for transfer of concepts and engagement/learning as visitors transition between exhibit components. How might this research impact museums and other informal learning? NSF is interested in learning more about how digital learning opportunities influence museum visitor experiences, and whether digital play opportunities are value-added to more traditional, physical play opportunities. Our contribution to the broader understanding of digital learning in museum spaces is likely to influence future activities at NSF and in museums. There are scientific and social reasons to use technology in museums, but there is still a lot to learn about how technology influences engagement, learning, interaction and the overall experience. Both NSF and children’s museums are seeking this information about the role of technology. With regard to the play constructions of visitors, we have specific interest in learning more about child-adult interactions to examine communication that might inform hypothesis testing, engagement, learning and quality of interaction. Often, learning in museums is individualized. In the case of children’s museums, learning is generally tethered to connecting new experiences to prior learning and experiences. However, many adults do not engage actively in shared experiences with children at children’s museums. NSF and children’s museums in general are interested in exhibit design features and content that promotes intergenerational learning. Intergenerational interaction at children’s museums is important because it tends to increase child engagement, and thus learning, and there is a positive influence on the overall adult-child relationship during the museum experience.